Cape Town designer Piers Mansfield-Scaddan of Fly-Pitcher presented these lamps based on the faceted shape of a stove-top coffee pot at Design Indaba Expo in Cape Town last month. Called The Espresso Lamp, the folded and riveted metal design comes in three sizes - single, double and mini. Piers Mansfield-Scaddan is launching a new range of furniture and table lamps at Design Indaba 2011 inspired by industrial fabrication techniques and craftsmanship. Showcasing several industrial processes, the range reflects Piers’ obsession with all things technological. “I use industrial technology but not with a focus on mass production but rather to batch and limited editions. I labour over every detail, and this brings a sense of the handmade back into my work”. 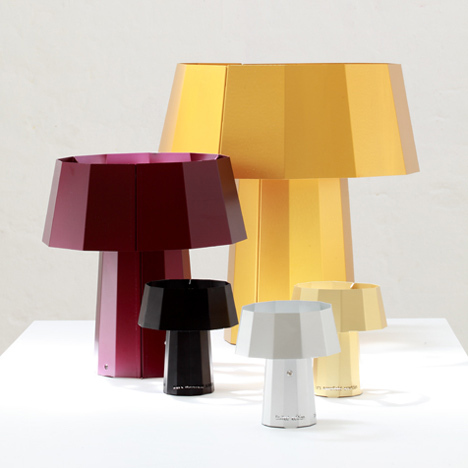 The Espresso Lamp and is available in a wide range of colours and in 3 sizes, referred to as single, double and mini espressos! For Design Indaba Piers will be releasing a limited edition series of 100 mini espresso lamps – individually numbered and available on the stand.